This May 13th, 2017, the 25th Annual Letter Carriers' Stamp Out Hunger Food Drive begins anew. 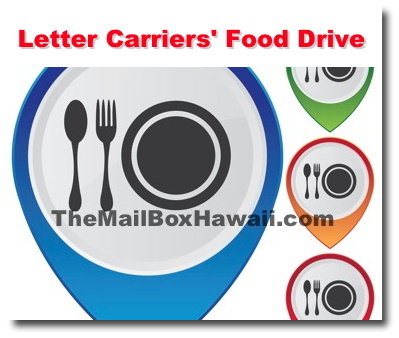 Letter Carriers nationwide will collect your donations of non-perishable food items left in or beside mailboxes and post offices to feed America's hungry. To donate, simply place your non-perishable food donations next to your mailbox before your letter carrier delivers mail on Saturday, May 13th, 2017. Once collected, the donations are sorted, and delivered to a local food bank or pantries and shelters.